The Home Energy Saver™ (HES) empowers homeowners and renters to save money, live better, and help the earth by reducing energy use in their homes. HES recommends energy-saving upgrades that are appropriate to the home and make sense for the home's climate and local energy prices. The money invested in these upgrades commonly earns "interest"; in the form of energy bill savings, at an annual rate of 20% or more. The site is an interactive do-it-yourself home energy assessment tool, combined with extensive decision-support content. The site is developed and maintained by the Lawrence Berkeley National Laboratory with sponsorship from the U.S. Department of Energy (DOE) and others including Touchstone Energy Cooperatives. 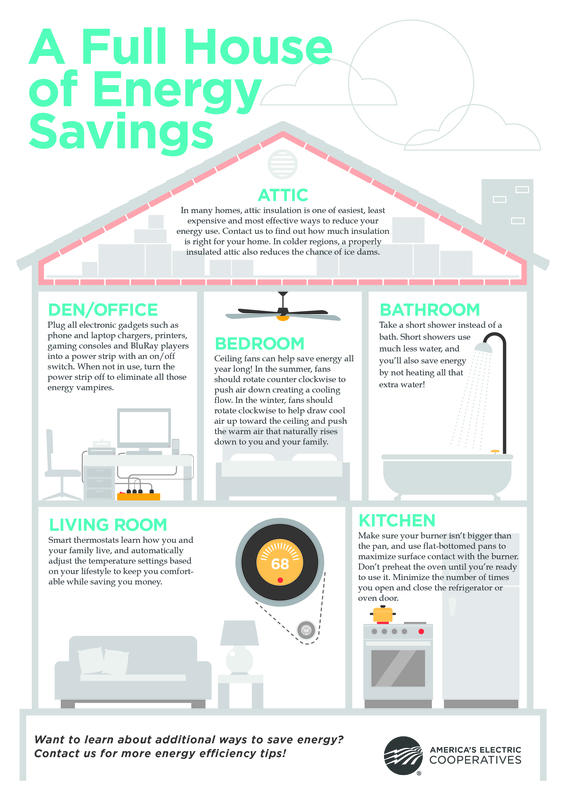 The graphic to the right also provides tips on how to save energy throughout your house. Be sure to check out all the rebates available through JREC's Energy Sense Program.